I am often disappointed by people, especially by those I love and care about. I was pondering the happenings with one of the clients I am working with, and how she is not doing what she needs to. How she is failing her family. So many times I set out to help people obtain what they need to attain. Or what I think they need to attain. I think when they do this, when they do that – we will be better, they will be better, things will be okay. But Jesus, He loved people right where they were. He set a standard for the people around him, but He loved them despite of what they were. If we want people to succeed, we need to love people where they are. We need to set a standard before them with our life. We need to love them to Jesus. The reason that we love – is because Love never fails. 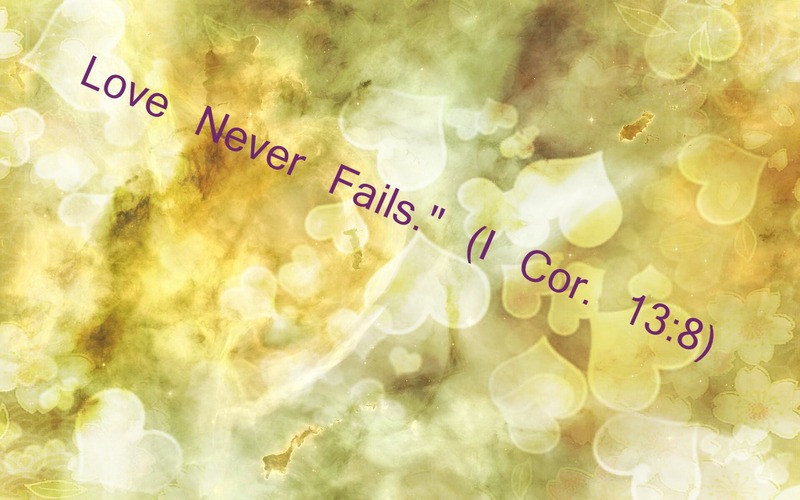 Love never fails because God is Love (I John 4:8) and God never fails. This entry was posted in Hope and tagged Love, Relationship, Scripture. Bookmark the permalink.